You'll be £12.99 closer to your next £10.00 credit when you purchase Pill boxes on the Western Front. What's this? When the First World War froze into a static line of trenches stretching from the North Sea to the Swiss border, the most obvious means of protection against the murderous machine-gun fire which both sides inflicted upon each other was some form of shell-proof shelter which from which fire could be returned in safety, hence the development of the pill box. The idea was certainly not new but the technology required to build them under the prevailing circumstances presented problems hitherto undreamed of. 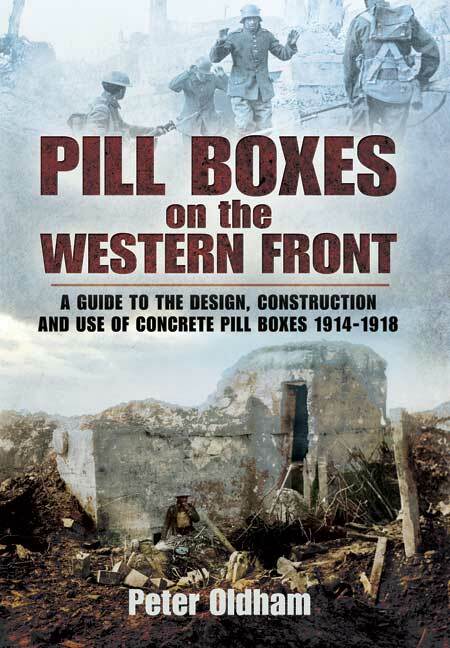 In this remarkably absorbing study of what at first seems a somewhat arcane study of what at first seems a somewhat arcane subject, Peter Oldham, himself a concrete technologist, examines the problems of the design and construction of the pill boxes of the Western Front. He describes how the innumerable difficulties involved in what might to the untrained eye seem to be a fairly simple structure, were gradually overcome. Containing as it does, a gazetteer of the remaining pill boxes and bunkers still to be found in Flanders and Picardy, this book will prove an invaluable guide to the members of many clubs and societies which annually make pilgrimages to the battlefields of the First World War and certainly add a new dimension and interest to their visits to the Western Front. The book is full of the most wonderful photographs of pill boxes, with detailed plans and drawings of how they were made. Also included is a Glossary of terms and an index. Peter Oldham has a wealth of experience to bring to the writing of this book, since he worked in the production and supply of aggregates and concrete to the building industry. That explains his interest in the pill boxes of the Western Front. I found the book utterly fascinating. Although Peter goes into a great deal of detail describing the supply and construction of these defence structures, the book is not just about pill boxes. Peter also explains in detail how the war came to last so long by describing the incredible lengths the Germans went to digging in, constructing and camouflaging their lines of defence. A review can’t do justice to this fantastic book – I urge you to read it for yourself. At first glance not much that would appeal to the average non-sapper! But actually, this is quite a treasure trove of Western Front information and data. Here’s a subject you don’t get to read about much – pill boxes. Well, this superbly researched book explains why these fortified defensive positions were so important, and the man difficulties in their design and construction (not as simple as you might think). With plenty of photographs, drawings and diagrams, this is a great book to have on your shelf and one which will open your eyes to something you had probably never given any thought to before. A good glossary and a comprehensive index complete what is a detailed and painstaking stuffy, the fruit of much research, told in a fluent and lucid narrative. Concrete! Yes, that hard, grey stuff we make buildings with. Makes for a pretty dull topic eh? What if, though, you were ordered to mix-up a few tons and construct a pillbox in complete darkness and complete silence? Moreover you have an enemy force less than a hundred yards away - listening and watching! Not such a dry subject after all eh? This is just one of the themes covered in the sharpest of details in Peter Oldham's precise and thorough history. This is quite simply a brilliant book on what I initially believed would be too technical for me. Chapters are divided into manageable chunks and chart the origin and development of pillboxes. Oldham's book which is lavishly assisted in no small part by a plethora of black and white photos (I counted over 100) and detailed plans of bunkers and pill boxes. But it's not just bunkers and pill boxes depicted in the many photos and text, but examples of how concrete protection spread from the frontline to the rear lines. This is a pretty comprehensive guide to what I suppose is an often overlooked aspect of warfare. If you're planning a field trip to a Western Front Battle or just seeking detailed plans for a scale model of a pill box or bunker then this book will provide you with all the information you could possibly need. Highly recommended. This is the reprint of the 1995 hardback published by Leo Cooper. It is not a second edition; there is neither new material, nor modifications. The author is uniquely qualified to make observations on Allied and German concrete defences as he is a concrete technologist of many years experience in the design, building and testing of concrete structures. Our late chairman Jock Hamilton-Baillie is names in Oldham's acknowledgements. The book begins with a chapter describing the development of the use of concrete in fortification building. This dates from the middle of the 19th century with Britain as usual, lagging behind continental fortress-builders in its use. The French designs of Sere de Rivieres turned out to be superior to those of the Belgian Brialmont when tested in WW1. The quality of French concrete and their scientific approach to the ‘layering’ of defences using a concrete, sand and steel sandwich contrasted with the simpler Belgian works, plagued by rogue suppliers and construction firms in some forts. The French forts around Verdun withstood heavy bombardments better than Liege and Maubeuge. Further chapters describe how Britain worked to catch up with German design and technology. There were many studies and reports on captured defences and the techniques used to construct them. The Germans devised a method of using pre-cast concrete blocks tied with steel beams for the walls of bunkers with a cast concrete reinforced roof. Britain stood by monolithic (concrete poured between shuttering) pillboxes, but later minds were changed and we resorted to the block/beam method. By July 1918, one factory alone was making over 7,000 wall blocks and 700 + roof beams every day. Concealment was crucial in pillbox siting and many were disguised as other types of building (frequently as ruins). An important chapter describes how captured bunkers were adapted for use against their former owners by being ‘turned around’. Some German pillboxes were built in the front line itself which seems remarkable. Other chapters explain the building of extended defence lines such as the Hindenburg, the British GHQ, and the German defence along the Dutch border. A good glossary and a comprehensive index complete what is a detailed and painstaking study, the fruit of much research, told in a fluent and lucid narrative. It has to be said that the reproduction of the photographs and diagrams in this paperback does not match up to that in the original. It is however, much handier to carry on a field trip and represents food value for money. This is the new paperback edition of a book originally published back in 1995. The author had a career as a concrete technologist, and maybe no surprise therefore that he took an interest in the development of Pill Boxes as we came to call them, or MEBUs as the germans referred to them (Mannschafts-Eisen-Beton-Unterstand = reinforced concrete shleter for troops to stand under). I suspect that many like myself will often associate the concrete Pill Box with those we see here in Britain that date from WW2, or those of the German Atlantic Wall, and the Seigfried and Maginot lines. In fact there were huge numbers used in WW1, and some of those that survive today could well be mistaken by the casual visitor as something from WW2. Although we think of the static Trench Warfare of the years of WW1, it was otiginally seen as a war of movement, one which didn't happen, and we didn't pay too much attention to fixed defence positions at first. It was the German army that first took best advantage of using concrete shelters for their troops, to protect them against artillery and machine gun fire. Once the British and French realised how effective they were, both as troop shelters and machine gun posiitions, so we investigated those we did capture, and began building more of our own. As the war progressed, so the technology of the designs, and the protection they offered, was improved. Peter Oldham has written a really interesting and readable book about their development during the course of the war, one might say their evolution. Building work in the front line attracted attention and invited attack, so camouflage and simpler construction methods, such as pre-cast sections or building them from blocks were all widely used. Only further back could large scale concrete construction go ahead unhindered. Then as the lines did move after an offensive, captured pill boxes would be 'converted' by the new owners, often being reversed as doors usually faced away from thee enemy, so once captured needed to be sealed and a new entry opened in th opposite side. The book is well illustrated thoughout, with sketches of the different types of construction, cross-sections showing how they were made up, period photos along with many photos from recent years showing the remains of those that can still be found today, though they are still disappearing on a regular basis as they deteriorate or are demolished to make way for new construction. It is broken down into 7 chapters, covering Development, the early work and evolution of the cememnt, then Solid Defence as Germany started constructing permanent defences and how geological services and materials supply became established by both sides. Then the British Findings as they studied what they captured on the Somme, and mention of studies and reports, a couple of which are reproduced as appendicies in the book. Then the Difficult Conditions encountered in construction, and the use of pre-cast blocks. The External and Internal issues are dealt with, such as camouflage outside and the comfort and safety of those inside, as well as the work involved in turning a bunker around. Towards the end, major works in the Defence Lines are tackled, before a final section on Coastal Defences both here in the UK and on the Belgian Coast by the Germans. These are all followed by a useful Gazetteer, describing where a number of remaining concrete pill boxes from WW1 may still be found. As someone who has gained an interest in bunkers and pill boxes over the years, or 'lumps of old concrete' as my family refer to them as, this is a fascinating read about the early days of the military use of concrete and steel reinforments, and the changes in design to meet different objectives. Should it just be able to withstand small arms fire, or the impact of artillery rounds, as depending on that answer, different issues are involved in the design. As technology moved on during the war, so too did the technology behind the structure of reinforced concrete defences and this is a good insight into those early days.